From 2002 until 2009, the Kia Sorento was a body-on-frame SUV. Today it’s a crossover and we think it happens to be one of the best non-luxury CUVs you can buy. 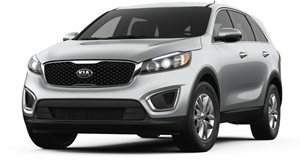 Now in its third generation, the Kia Sorento is a mid-size, three-row CUV that's literally been tailor-made for Americans. and were nothing less than impressed with the overall package. Power comes from a 3.3-liter V6 with 290 hp and 252 lb-ft of torque sent to all four wheels via a six-speed automatic.